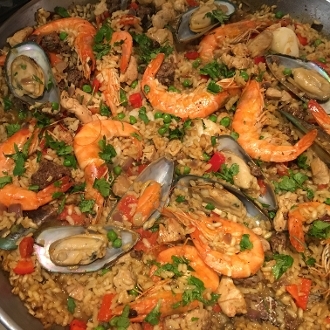 PAELLA CLASS – This is a Great Spanish Dish for a large family gathering, party of friends or lovers of seafood! Embellished with spices and chicken, and succulent seafood that keeps great for week, or freezable for a rainy day! Take it to work to make your co-workers jealous of your skills. You will learn professional knife tips while preparing the items to cook, and how to keep your rice al-dente and step-by-step instructions for the execution of the dish It’s healthy, colorful and you’ll be excited to share it with your family and friends. Dinner Includes Shrimp, Mussels, Scallops, Chicken Breast and Chorizo Paella with Almond Cake for Dessert. Bring Cameras - Take Photos, Recipe, Menu and Pencils are provided for you to take notes. Only Paid Registrations get Guaranteed Class Seating.